Totalitarian nation state Panem is in chaos. When Katniss Everdeen (Jennifer Lawrence) shot her arrow into the force field of the second Hunger Games arena she put in motion a series of events that led to a rebellion – one that has been brewing since the birth of Panem. The opening scene of The Hunger Games: Mockingjay – Part One finds Katniss battered and damaged, hiding out in the previously thought-to-be destroyed District 13. 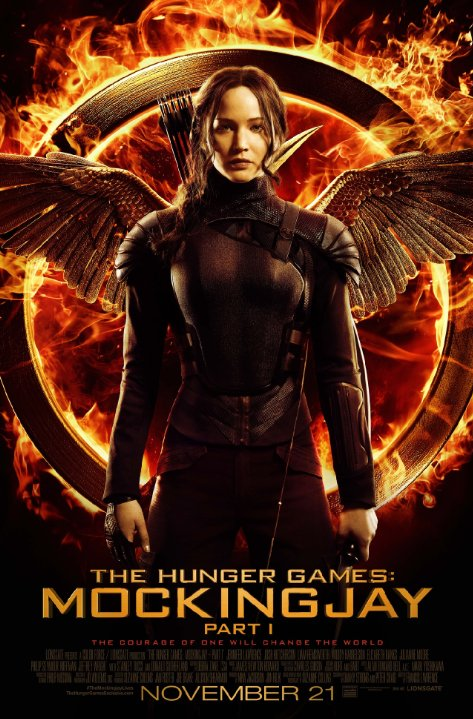 Katniss’s rescuers, the rebels, are in control of District 13 and are mounting an uprising against the Capitol and fashioning her as their poster girl. Katniss assumes her role with her usual no-nonsense exterior whilst privately battling with her own demons of post-traumatic stress. The first two films in this franchise followed a specific formula that delivered high-adrenalin action and believable character development without skimping on emotional content. I was a little concerned that without the actual Hunger Games to build towards, Mockingjay would lack the same structure and emotional punch of its predecessors. Luckily for me (and all the other screaming fan girls out there) this film set itself apart from the rest of the series with aplomb. It should be said that even if this film bombed I was still going to enjoy it. Obviously this film was going to rake in gargantuan amounts of cash but that wouldn’t stop it from being a critical disaster. I’m far too invested in these characters and this story (such is the tendency of obsessive geeky types) not to enjoy seeing them up on the screen, but it must be noted that this film is not without its flaws. 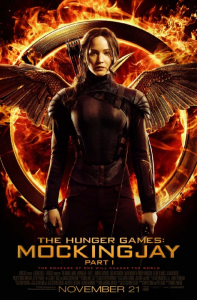 Mockingjay feels a little stilted, though this is to be expected given the story structure – film goers used to the high action/emotional intensity delivered by the previous two films may be surprised by Mockingjay’s change of pace. The first conversation between Plutarch (Philip Seymour-Hoffman) and rebel leader Coin (Julianne Moore) seem forced, as though the intentions and subtext intended in the scene were unclear to the actors. Likewise, the first scene showing Katniss, in which she is clearly traumatised and unable to sleep, poses a similar question – what tone is the director trying to set here? However, the more compelling scenes far outnumbered the weaker ones. One of major themes of this film – the manufacturing of a charismatic hero through media and clever editing is poignant, especially now. The ‘making of a hero’ storyline, following Katniss as she struggles to read the pre-prepared, stiff lines the rebels have fed her, juxtaposed with her defiant ‘if we burn, you burn with us’ speech was absolutely spot on. Here is a character best left to her own devices; she is not a tool in yet another Hunger Games, she is a young woman in charge of her own power. What I enjoy most about the character of Katniss Everdeen is how inherently and believably flawed she is. Like other heroines of her ilk, such as Buffy Summers or Ellen Ripley, she is far from perfect and doesn’t try to be. In each film she has very clear and simple motivations; in the first instalment, she plays the Games to keep her sister alive; in Catching Fire she fights to keep Peeta (Josh Hutcherson) alive. In the series’ penultimate film, Katniss’s goals are now not of her choosing and she is being forced to bend to the will of the rebels. Deriving strength in herself and from her sister, Katniss once again finds a way to bring her actions into line with her own agenda. She recognises her own value to the rebels and therefore takes her own set of demands to rebel leader President Coin. Katniss is therefore able to fight on her own terms and for her own motivations; to free Peeta from the clutches of the Capitol. She is not a pawn in anyone’s games. As a rule I’m not normally a fan of this trend of splitting the final movie of epic sagas into two parts – it’s often self-indulgent and leads to convoluted story-telling. However, I felt that Mockingjay – Part One deserved to exist in its own right; it did not merely set the scene for a bloody climax but further explored themes of totalitarianism and the public’s perverse relationship with reality television.